Powerful, expressive, and compelling! Now you can see what it takes to be a stronger, more elegant dancer. 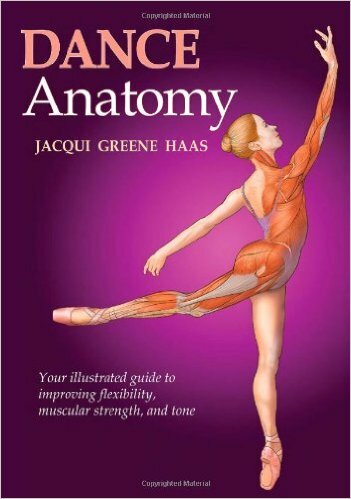 Featuring over 200 full-color illustrations, Dance Anatomy visually depicts the unique relationship between muscle development and aesthetic movement as never before. Dance Anatomy features 82 of the most effective dance, movement, and performance exercises, each designed to promote perfect alignment, improved placement, proper breathing, and prevention of common injuries. In stunning detail, the accompanying illustration captures the dancer in motion and highlights the active muscles associated with each movement. You’ll learn how to modify exercises to target specific areas to enhance flexibility and reduce muscle tension. You’ll also learn to put it all together to personalize a program based on your style of dance, level of expertise, and individual needs and goals. Jacqui is a frequent presenter, speaking to dancers, instructors, and health care practitioners, including presentations at the International Association of Dance Medicine and Science and the National Athletic Trainers’ Association conferences. She has been published in Dance magazine and Advance Rehabilitation magazine.